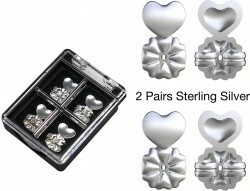 PACKAGE INCLUDES— 2 Pairs of Sterling Silver MagicBax and a Jewelry Case to hold both pairs! HYPOALLERGENIC & ADJUSTABLE! — Our earring lifters are made with sterling silver! They are also adjustable for post earrings of various sizes! LIFT, SUPPORT&SECURE YOUR EARRINGS! — Helps to repair the appearance of torn, damaged and stretched earlobes instantly! Worn behind your ear lobe, the earring backs are the perfect remedy to avoid the problem of heavy earrings tearing and stretching your earlobes. LOVE — Our hypoallergenic earring lifers are the perfect solution to help your earrings stay in place. A comfortable way to enhance the beauty of your earrings and make them stand out all day long! EASY TO USE EARRING SUPPORT BACKS! — Simply slide the earring post into it, just like any earring back. This enables your earrings to rest on your ear comfortably while being securely reinforced!